I'm going to write my quick thing before reading anyone else's stuff so if I repeat stuff, sorry! First off when I opened my package I was brought to tears. I am so ecstatic and proud that Vanessa has shared such an intimate moment of motherhood with us. I had always wondered if she'd ever step up to the plate like some celebs (namely Alyssa Malano) and post a breastfeeding pic on instagram or twitter. I figured she would never, being she's so private in the first place and this can be a hot button issue (don't get me started on why it shouldn't be, that's a whole other thread for a whole different website). So when I opened my package to see her in such a gorgeous snapshot on the lyric book cover... I was very moved, and every time I think about it I am moved. As a mother, a nurse, and a lactation consultant I just couldn't be more proud to be a fan of hers. I had actually given in and listened to the album stream the other night at work. we were having a craptastick night and I just needed it to calm me down, and it did. It brought me in to a zone where I could just relax and forget about all the stuff going on around me. Now that I've got the album it will be on repeat (after nap time of course). House of Seven swords was not one of my favorites I had heard live, but this album version is fantastic. I'm so glad the production of unlock the lock is so minimal, that was my favorite live. operator is so good. it's done in a pop way but an alternative pop way. it actually reminds me a lot of the music she was listening to shortly after rabbits came out .. she posted songs that she liked almost daily back then and I downloaded a bunch of them. so this album feels to me almost like i'm listening to her play list. lyrics are inspiring, and build upon themselves as always. I had worried about all the lyrical repetitiveness in the songs I had heard live but it works in the studio versions. I have nothing technical to add but I am very impressed by this album, I like the way it's been done. I'm glad we have the live versions of most of the songs, but I think I'll be listening mostly to the studio versions! Each version of the song is like it's own song anyway.. related but not exactly the same. I think I remember someone saying that nothing where something used to be sounds more hopeful on the studio version, and more remorseful and sad for the live version, and I totally get that now that I've listened to the studio one. ok that's all I have to add! I had a DHL notification a couple of days ago and both the regular & deluxe edition arrived today in my mailbox! One was sent through DHL and the other by FedEx. Go figure. Kudos to Dine Alone Records for upgrading shipping so overseas fans can also get it on release day. It's a small gesture but much appreciated! About the album, I'm in love. That sums it up. Am slightly devastated that A Matter of Time doesn't have a living room session as it's my favorite song from the album. 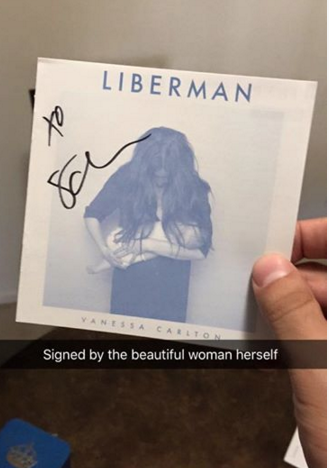 Here's my (extremely long-winded) track-by-track review of "Liberman"! Great review! I totally agree that ROTR is only a departure from her past work in terms of the musical production - she's been remarkably consistent in terms of the actual songwriting. And HAHAHA about Senator Lieberman - I'm from his state and I thought the same thing when I heard the album title for the first time.